Ronny Deila says Celtic will not face a tougher opponent than Qarabag in the Champions League play-off round. 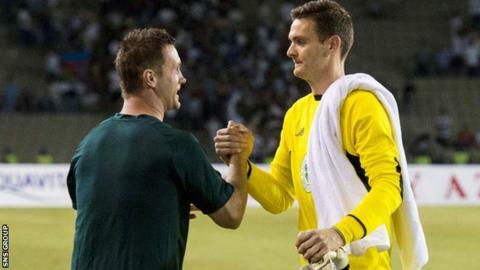 A 0-0 draw in Baku gave Deila's side a 1-0 aggregate win over the Azerbaijani club in the third qualifying round. Celtic will be seeded in the champions' side of the draw when it takes place on Friday. "We'll take what's coming and I don't think that team will be better than the team we met today," Deila told BBC Radio Scotland. "It was a long game. I'm so proud of the team. They worked really, really hard and showed good discipline. "It was a very good team effort. We defended very well. Offensively, we should've punished them more than we did. "We have to understand that we met a very good team. Last year they beat Dnipro, who went to the final of the Europa League. They had good results against Inter Milan as well." Deila hopes his side can "play more" in the next round, having been restricted against Qarabag. "In the future we hope our team can be more on the ball and cause them more problems but we are not there yet and we need to defend well," he explained. "We did that properly and we deserved, in the end, to get through. The players get better every day." Celtic lost 2-1 on aggregate to NK Maribor in last season's Champions League play-off round and Deila believes his squad is better equipped to progress this time. "We have a lot more legs to the team [than a year ago]. The amount of metres we ran today was unbelievable," the Norwegian added. "We have very good team spirit, we know each other and we also have a style of play that everybody knows."